When one of our King Dental Group patients needs a crown, a dental assistant makes an impression of all the teeth. The impression is sent to a laboratory where the plaster teeth are separated. The individual tooth mold in need of restoration is scanned into a computer to have the exact dimensions to send to the factory. The cutting-edge factory has a computerized machine that will then pour plaster into cylindrical molds, resulting in blanks. Once hardened, the process of making the tooth from the plaster blanks begins. 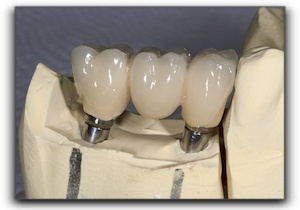 The crown is then fired to making the porcelain more condensed throughout. More hand contouring follows, as needed, and then is finished with a clear, ceramic gloss. If you have a broken tooth or old, unattractive crown, or want details about dental implants, call 805-687-1548 to discuss the possibilities.